A fusion entails one vertebral body (ex. L4) fusing to another (ex. L5). This provides stability and decreases pain from the facet joints and disc	(ex. L4-5) in between the vertebral bodies. The ALIF procedure has the	benefit of obtaining excellent fusion potential thru a minimally invasive	approach. Minimally invasive surgery entails minimal damage to muscles	in the approach to the spine. The ALIF incision is beside the umbilicus. The rectus muscles are mobilized without cutting or damaging them. The	abdominal contents are contained in a sac (peritoneum) which is moved	from left to right to gain access to the spine. The disc is removed and	replaced with a large spacer (typically plastic or bone) and bone graft	(or substitute such as BMP). The size of the spacers inserted thru the	anterior approach is typically twice the size of spacers inserted from	the back (TLIF or PLIF approach). The larger spacers provide increased	stability, increase the disc height in order to restore alignment, and	increase the chance of successful fusion. 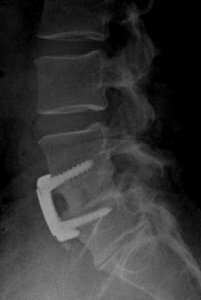 Pedicle screws, which may be	used for additional stability, are inserted into the bone in order to	stabilize the motion segment (ex. L4-5) and increase fusion rate. We insert	our pedicle screws under three-dimensional computer navigation which increases	the accuracy and safety of the procedure. Ninety-one percent of our patients	have had pain reduction with an ALIF procedure with an average pain reduction	from 8/10 pre-op to 3/10 post-op. 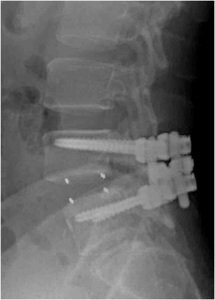 Here is an example of a patient that underwent an ALIF procedure with pedicle	screw placement. The patient suffered from back and bilateral leg pain	for 2 years. He failed conservative management in the form of physical	therapy, spinal injections, oral medications, and activity modification. He underwent the ALIF procedure with a PEEK spacer, posterior pedicle	screws, and decompression. His pain reduced from 9/10 pre-op to 3/10 postop	(final follow-up 18 months). Here is an example of an ALIF procedure with an anterior plate. The benefit	to the anterior plate is that only the muscle-sparing anterior approach	is done (from the front), with no disruption of the posterior back muscles. The patient suffered with back and left leg pain. He had undergone intensive	physical therapy trunk stabilization exercises and multiple spinal injections. 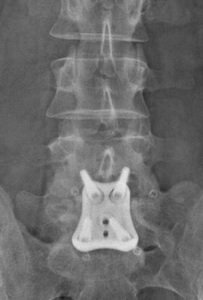 He underwent a fusion at L5-S1 via ALIF and pedicle screws and decompression	in order to treat his degenerative disc disease and stenosis. The patient’s	pain decreased from 8/10 pre-op to 3/10 post-op (last follow-up was two	years post-op). Figure 3. 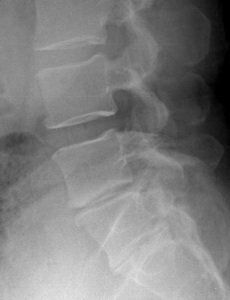 The pre-op lateral x-ray shows loss of disc height at L5-S1. Figure 4. 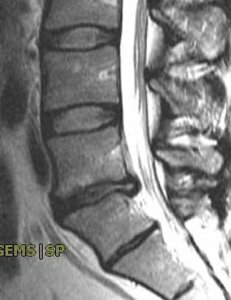 The pre-op MRI shows a dark disc at L5-S1 with loss of height	and encroachment on the spinal canal causing stenosis. Figure 5. 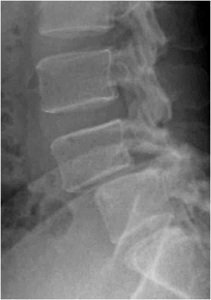 The post-op lateral x-ray shows the bone graft spacer in the	disc space, which has restored the height of the disc and lordosis (normal	curvature of the lumbar spine), and the anterior plate and screws. Figure 6. The post-op AP x-ray shows the plate and screws.